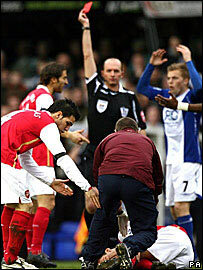 Arsenal manager Arsene Wenger said Martin Taylor should "never play football again" after the Birmingham captain's tackle broke Eduardo's leg. Eduardo went down in the third minute of the Premier League encounter and Taylor was shown a straight red card. "The tackle was horrendous and this guy should never play football again," Wenger told BBC Sport. But Blues boss Alex McLeish responded: "Martin's not a dirty player. He's distraught over Eduardo's injury." Eduardo, 24, remained lying on the pitch for seven minutes as medical staff attended to him before he was stretchered off and taken to Selly Oak Hospital. Wenger hit out at the way he feels his team have been targeted by opponents. "It goes with the idea that to stop Arsenal you have to kick Arsenal and that kind of thing was waiting to happen," he said. "Many people have got away with too many bad tackles. We've escaped a few times but it's just not acceptable. If that is football it's better to stop it. "The worst thing you hear after is that 'he's not the kind of guy who usually does that', but you need to only kill one person one time - it's enough." McLeish, however, sprang to the defence of his player. "I've seen the challenge and, yes, the studs land on Eduardo's ankle. In slow motion these tackles always look bad but he's not a malicious player - Eduardo was just too quick for him," he explained. "The referee's done his job, it's a sending off, but Taylor's not a malicious player." Birmingham released a statement later on Saturday saying the club were "saddened that such a fantastic game of football has been marred by a serious injury"
It added: "Martin Taylor is adamant there was no malicious intent in the tackle and he is deeply upset by the extent of Eduardo's injury. "Having reviewed the incident, this (no malicious intent) is clearly the case. The club and Martin Taylor would like to send their very best wishes to the player for a speedy recovery." The seriousness of the injury was apparent as both sets of players and medical staff looked shocked while Eduardo was treated on the pitch. The Brazilian-born striker now looks certain to miss out on Croatia's participation at Euro 2008 in June. "It was a massive shock for the team. They've seen what kind of state he was in," Wenger added. "He's a fantastic guy and to see him in such pain and the shape of his leg was very difficult for the players. "We hope he comes back quickly but the minimum is his season is over and we are scared that it is much longer." Wigan boss Steve Bruce, who signed Taylor from Blackburn when he was Blues boss in February 2004, said his former player would never intentionally hurt anyone. "Martin Taylor is the biggest, gentlest man," said Bruce. "There will be nobody more upset and sickened than him, there is not a bad bone in his body. "He would never, ever do anything malicious. He has mis-timed the tackle, and I've seen it. Some would say it is not even a yellow card."